Injured in a late November game against the Buffalo Beauts, Anya Battaglino hasn’t let being hurt get in the way of her making a difference, just like her groundbreaking sisters are in the inaugural NWHL season. 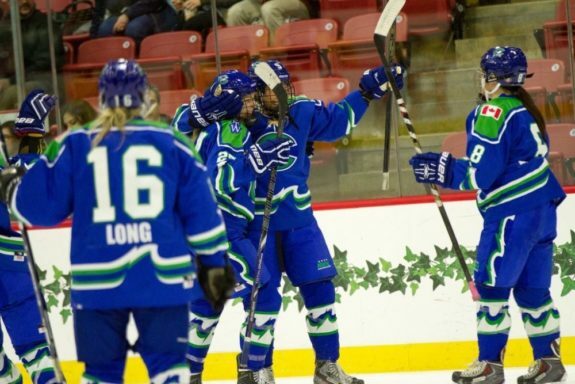 In fact, the Connecticut Whale blueliner is doing so many good things, having a little fun and taking us all along for the ride on social media while she continues to rehab her injury — in hopes of returning in time for the NWHL playoffs. Before she took over the Whale Twitter account while she was at the Winter Classic on January 1 (and had boatloads of fun doing so) Battaglino announced on her own account just before Christmas that she would donate hockey sticks to less fortunate kids for every 50 followers she gained; her teammate/roommate Kaleigh Fratkin also joined up and the two ended up donating a total of 15 sticks. In the Christmas spirit, for every 50 new followers I will donate a stick to a child less fortunate. Starting count at 733. #HoHoHo ??? As she went on to explain to us about the mini campaign that she started in the holiday spirit, you could see how much it meant to her. The passion in her eyes. The excitement of not only making a difference by donating sticks, or being an NWHL player, but also the ability to impact the future generations by simple gestures on social media; responding to fans and interacting with possible future professional players. Battaglino gets it, and the league in it’s infancy stages is filled with amazing trailblazers and pioneers. The experience was a reminder of how fortunate Battaglino and her NWHL counterparts are, now that they can say they are the first women to earn a paycheck while playing professional hockey, and this is just the beginning of more great things to come as they inspire children all over the world that they one day too can live out their dreams. While they aren’t getting paid like NHL players, it’s a start, and it’s something that a lot of people likely never thought of a year ago at this time. Now, it’s a reality. As mentioned earlier, Battaglino and the NWHL are all learning about how they can grow their game and names with the ability to truly interact with their fans in the social media era that the world is in. They’re almost truly learning on the fly as some of the women that maybe weren’t well-known Olympic or high-profile college athletes are now becoming well known in the four-team league that is almost about to hold its first All-Star weekend (January 23-24) in Buffalo, NY. Battaglino grew up in Boston, went to college in Boston, played in the CWHL in Boston and now as she starts a new chapter in her life she wanted to face that challenge outside of Boston. It didn’t have to be that way as she could have possibly played for the Boston Pride in the NWHL, but she told THW why it was important and exciting for her to play hockey outside of Boston. There certainly will be more fun as the inaugural NWHL season continues and even more fun year after year. You can bet your you-know-what that Anya Battaglino will be documenting it along the way, having fun and making a difference in many young boys and girls’ lives day after day.